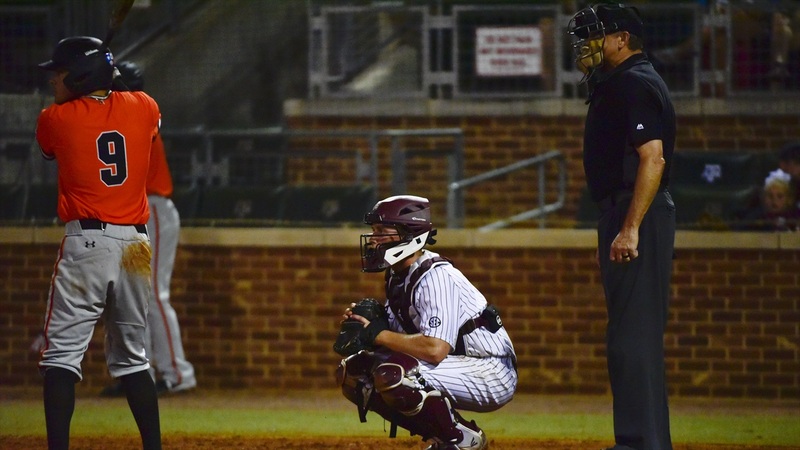 A lot of the preseason write-ups about the 2019 Aggie baseball squad have centered around the junior class that has been through the rigors and grind that is the SEC baseball schedule and deservedly so. There’s no doubt that the performances of guys like Braden Shewmake, Logan Foster, Cam Blake, Hunter Coleman, and John Doxakis will play enormous roles in the outcome of the season. However, even with that core group of experienced heads, several transfers will have to complement those aforementioned “household” names in order for Rob Childress’ club to reach its full potential. In 2018, Michael Helman came in as rather unknown to lead the team in multiple offensive categories. Could any of this new lot have that same type of impact? Let’s break down each of these guys and how their skill sets will likely be used throughout the season. RHP Jake Nelson - Nelson transferred in at semester after graduating from Penn. The reports on him have been glowing since his arrival in College Station. A 6-4, 210 pounder, everything that comes out of Nelson’s right hand is firm. The fastball has been up to 97. I’ve been told he’s arrived with that late game, ‘give me the ball’ mentality. I suspect Nelson to be one of the featured arms out of the pen, and he could potentially settle into the yet-filled closer role. RHP Kasey Kalich - Kalich began his ascent up the Aggie pitching depth chart late during the fall with a dynamite outing against Rice that woke up a sleepy (as usual) Reckling Park. Kalich comes to Aggieland by way of Blinn College in Brenham, and he steps on campus one of the more physically imposing dudes on the entire roster. The fastball is firm and heavy. He gets a lot of swings and misses which also makes him a viable candidate as the team’s closer. RHP Bryce Miller - Another former Blinn College Buccaneer, Miller is strike pumping, inning eater. His classic, high three-quarter delivery is easily repeatable, and he creates a solid downhill plane for a guy that is 6-2. Miller is likely a middle innings guy that, when he’s going right, will have efficient innings marked by lower pitch counts. MIF Bryce Blaum - Gamer. Dirtbag. Hard-nosed. Pick any adjective to describe the hardest playing sucker on the field, and you can apply it to Blaum. After being told he’d never be an SEC infielder at Ole Miss, Bryce has come back to Texas with a chip on his shoulder. He’s an outstanding defender at second base, and he competes like crazy at the dish. It’s a good bet he’ll be your everyday guy at second base and find himself near the top of the order. C Mikey Hoehner - There’s not a lot to do in Cisco, Texas except for play baseball, and that’s exactly what Hoehner did for two seasons. He’s turned himself into a plus defender behind the plate despite not fitting the typical physical mold of a catcher. Former A&M catcher (now coach) Michael Barash is a pretty apt comparison here. Hoehner can flat out catch, he leads by example, and he’s a model of how to play the game. Odds are he’ll catch a whole lot in 2019. OF Ty Condel - A product of Temple JC and Shiner, Texas, the name of the game for Condel is speed. He’s an outstanding runner. He’s also probably the best outfield defender on the roster that would push Logan Foster for the best outfield arm. I suspect we’ll see a lot of Condel late in games as either a substitute defender to protect a lead or a pinch runner that will pressure opposing defenses and pitching staffs. UTIL Johnathan Ducoff - Ducoff is probably the coolest story on thie 2019 roster. He’s played at Baylor, San Jacinto, and Houston Baptist during his career all while battling cancer. He found his way to Aggieland to play his final collegiate season, and he’s forcing himself onto the field. A savvy, experienced hitter who finds the barrel often, Ducoff gives the Aggies flexibility both in the lineup and defensively where he’ll likely split time between third base and left field. C Brandon Ashy - With Hoehner and Hunter Coleman getting the majority of the innings behind the plate this season, Ashy’s role on the team may go unnoticed and under-appreciated. However, he can be a bridge in case someone is knicked up, and he can also allow the staff to move Coleman around more between first base and catcher. Ashy is another Blinn College product. I feel good about our team. Even with the weather issues, we haven’t missed a day outside, and I think the guys are prepared. The weather should be nice for the rest of the week so that is a plus. Its been a lot of fun getting this team ready for the season. The players have displayed a lot of togetherness and have worked hard to be good teammates to each other. We are looking forward to playing someone in a different uniform. Left handed pitcher Jonathon Childress will be the starter on Sunday. The pitching competition has been tight. Childress has a great curveball that can make batters miss. The team is going to need Christian Roa’s presence from the bullpen from the right side. He can make two to three innings disappear quickly. Chris Webber has been a pleasure to coach. He is not afraid of competition. He’s a lot of fun for me to call pitches for. Webber has a great feel for the game. He does everything well, including fielding the baseball. He is going to get some opportunities to start in the middle of the week. I believe Chandler Jozwiak has risen in the bullpen as of late. He has the potential to be a weekend starter, that’s how well he has pitched. There is no drop off when he comes on. Dustin Saenz has pitched at a high level as well. I have lots of options as far as pitching goes. We are going to do whatever it takes to win on Friday, then take it from there. The Fordham Rams are the winningest team in college baseball history. They return their entire offense back from last season. They are great at stealing bases, so we must win the battle a first. Fordham is going to move runners with the bunt and try to build a lead. They are well coached team from the Bronx and they play with a chip on their shoulder. I want our team to be dominant defensively this weekend, as well as on the mound. I do not want us walking anyone because we want to make them earn everything. If we do that we’ll be in every game this weekend. I don’t want this to turn it into a beauty contest, I just want us to do the dirty work and put pressure on the Fordham pitchers.